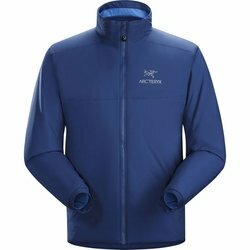 ARC'TERYX Atom AR Jacket. Significantly warmer and more protective than a fleece jacket, this insulated jacket is breathable enough to be used as a super warm mid-layer on frigid days and protective enough to be an outer layer while belaying or hanging out at camp. An extra thick dose of synthetic Coreloft insulates but packs small.